Yesterday’s Weed invited me to come back and take a second look at it in full sunlight today. Yesterday I’d spied it standing sentinel against darkening skies and back lit clouds. In the evening it had promised me that if I’d come back, I might be able to see new things in its simple image. It was grey and soft yesterday at dusk but today in full sun it stands ivory toned, blonde and honeyed as wheat, warm and inviting. Today I see quiet whispers of life, endurance of spirit and a framework built for catching life giving sunshine. A spider has visited my simple weed and left evidence of playing cat’s cradle. 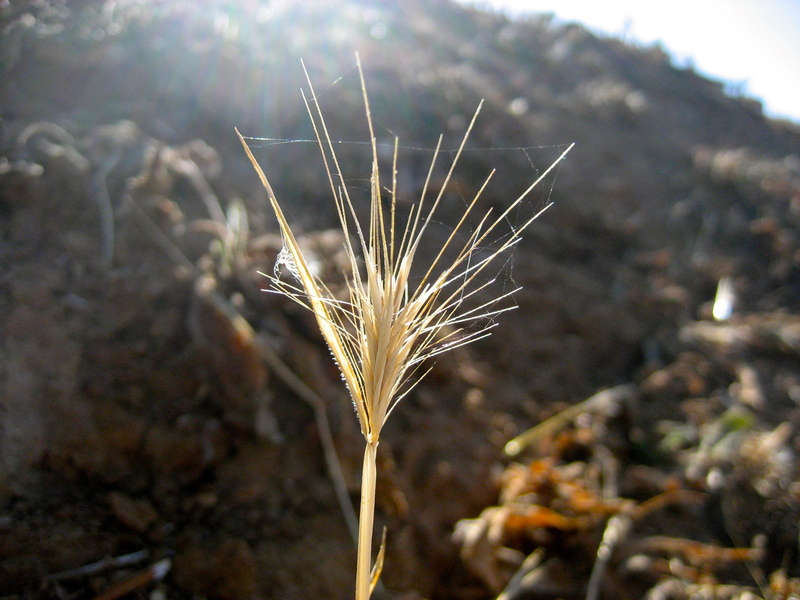 Some loose bits previously caught in the weed have blown away, and the weed’s grains have swollen in the heat of day, pushing the spikes outward to catch more rays and improve the odds for successful growth. It is today like an umbrella designed to catch rays instead of deflect drops. I think this weed is doing well today!